We built the most complete training solution for residential property managers, because we’re property managers, too. 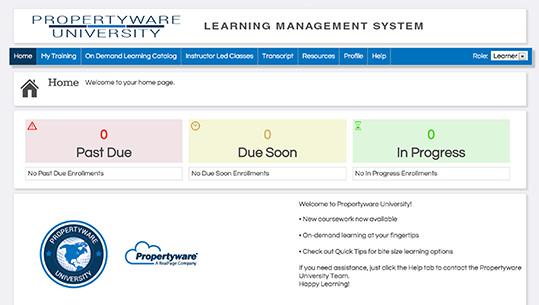 Propertyware University delivers unique, best-in-class training designed to kick-start greater productivity for new users and provide continuing training for all users. Your employees are able to take the training courses at their own pace, built in quizzes are available for each session, and we will track all the results. It’s everything you need to know about Propertyware, all from one resource. Gain entry to our top-of-the-line training information created to take you and your business to the next level. 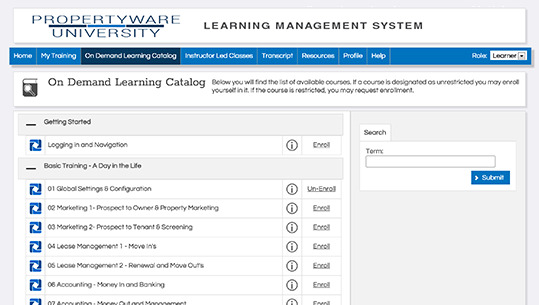 Choose from Propertyware’s extensive library of on demand training videos. Each course is designed to guide you through tasks, step-by-step, using an intuitive and easy-to-follow method. We also provide quick-step resources which are one page sheets for day-to-day reference. Throughout the year, Propertyware will be making its way to a city near you for a day of peer collaboration and inspiration. Whether you need some hands-on training, a little face time with us or are considering Propertyware as your new property management solution, spend a little time with us to become more knowledgeable on our product and learn what peers are doing in your local market to grow their businesses and operate more efficiently. What your employees don’t know about property management software could be costing you money. Propertyware invests in property manager training so you can invest in your employees. The result? More productivity, less staff turnover, quicker leasing, and ultimately happy tenants.